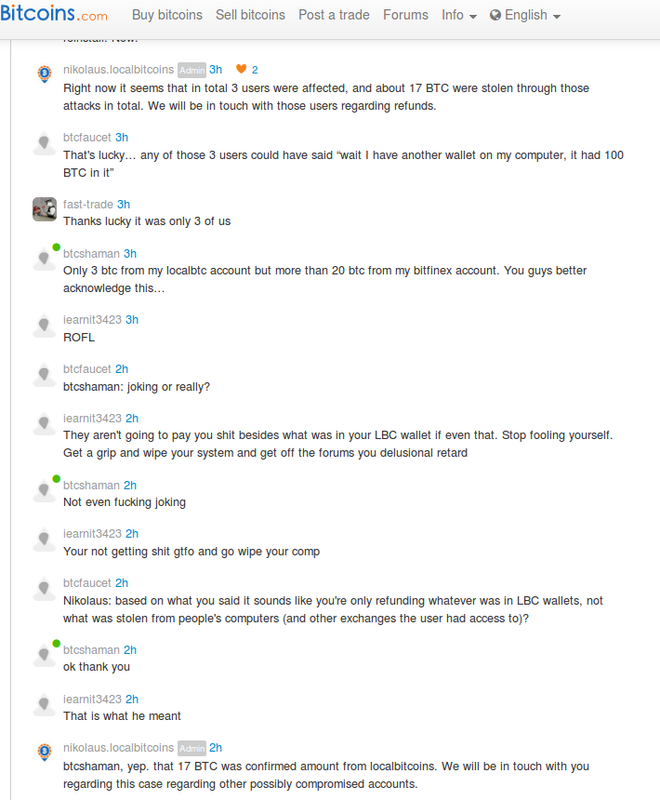 As you might be aware, the livechat accounts used by localbitcoins.com were compromised. Within those chats the impostor provided links to download executables, which probably had key loggers or other malicious software. If you had a chat with the support within last 3 hours, please do not open it, click any links or download anything provided by the support on the chat. We are now investigating the magnitude of this case, and will be in touch with the users who might have been affected by this as soon as possible. Right now it seems that in total 3 users were affected, and about 17 BTC were stolen through those attacks in total. We will be in touch with those users regarding refunds. Although LB have stated they will cover the loss, some users are reporting additional thefts from other sites as a result of having been compromised via chat. It's unknown at this time if LB intend to cover these losses by users who run random *.exe's despite their own service being compromised. This entry was posted in Exchanges, Fiat/BTC interfaces, Security. Bookmark the permalink. I wish the WoT order book had the same level of reach as LocalBitcoins instead of slowly receding. "Poor Price Signal" people willing to use LocalBitcoins can abide it. People serious about over the counter liquidity outlast it.